About 60 miles off of the coast of Belize, is Lighthouse Reef, with a bit of land called Half Moon Caye, which is one of the few homes in the world of the rare White Red Footed Booby. 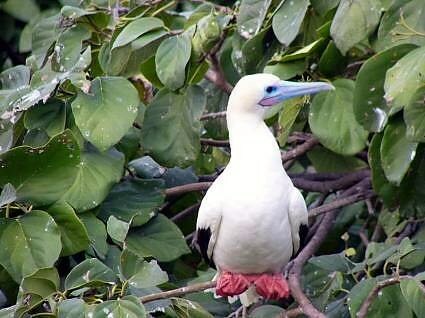 For any non-ornithologists a Booby is a species of bird. 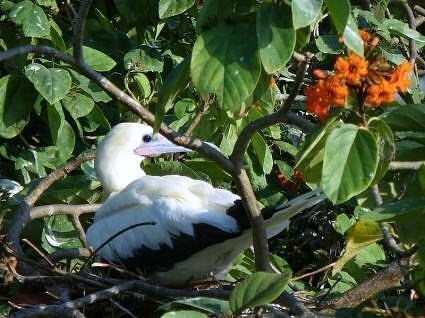 Lighthouse Reef also offers outstanding diving and snorkeling, notably the famous Blue Hole, however ashore on Half Moon Caye, is one of two known nesting spots for the White Red Footed Booby. Take a break between snorkeling or diving trips, and step ashore to follow the nature trail on Half Moon Caye that takes you right up in the trees near these very rare birds; rare because unlike most Red Footed Boobies which are a dull brown, these Boobies on Half Moon Caye are a bright white, which is seen only in one other location in the world on a small island near the island of Tobago. The western end of Half Moon Caye is the nature reserve home of the Red Footed Booby, watched over by the Belize Audubon Society. Through this densely vegetated area, a nature trail has been built leading to an observation tower. Climbing to the top of the observation tower puts you literally with the over 4000 Red Footed Boobies nesting in the tree tops. As these birds have become comfortable with the occasional visitor at the observation tower, a great opportunity awaits an ornithologist or just the plain curious to spend time at the top of the observation tower and watch the daily lives of these rare birds.An extra bonus is the frigate bird, long a friend of seafaring explorers as the first bird to be seen off shore signaling land nearby. Frigate birds have also made this area a home and often can be seen engaged in the courtship dance, inflating their throats into bright red balloons to signal their mating interest. As Lighthouse Reef and Half Moon Caye are only accessible by boat, take advantage of being able to see these rare birds on your yacht charter in Belize by making Lighthouse Reef and Half Moon Caye an important stop in your yacht charter itinerary. Visit the Northrop and Johnson Yacht Charter Website For More Information!